We will be hosting an exhibition opening for the artist collective Ava Grey at our gallery Chicago Truborn 1418 W Division St. on Friday, March 14th, from 7:30-11pm. “Ava Grey is a unique, art company, created by a diverse group of Chicago based street artists. As individuals, each artist has their own style and established brand. Combined as Ava Grey, they aim to create “larger than the sum of its parts” installations and environments which infuse vibrancy into the community. We are thrilled to be hosting the Ava Grey Collective for our next big show. They are completely revamping our entire gallery and their mural will blow you away!! 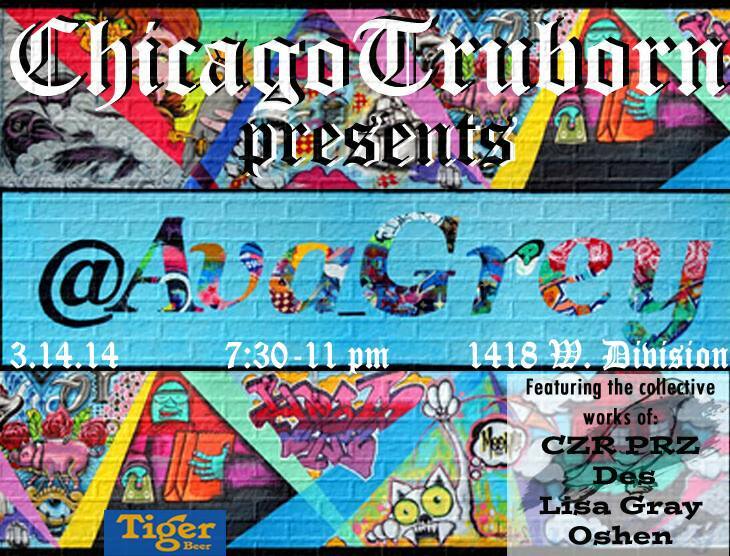 This entry was posted in Openings and Events and tagged art, Arts, Chicago, Chicago Truborn. Bookmark the permalink.